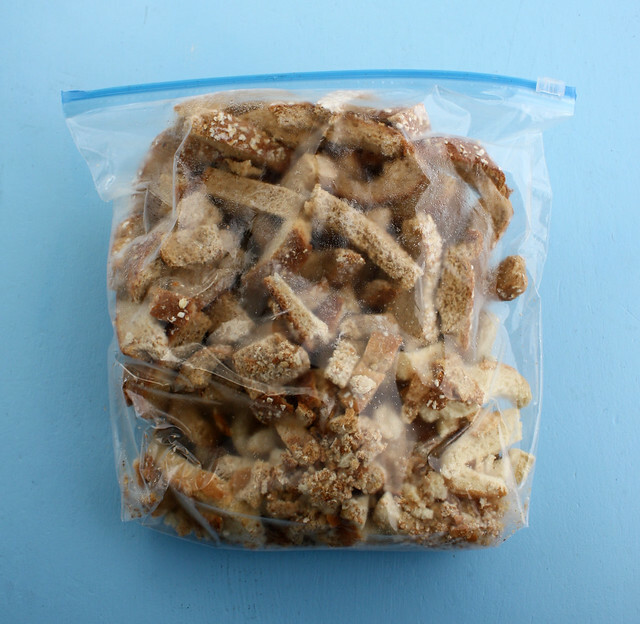 If you’re like me and you make cute sandwiches for your kids’ lunches, you’re going to end up with a lot of bread scraps. People often ask me if I throw all those bread scraps away and the answer is: No! I do not! Instead, I toss them all in a one gallon zip-top bag and stick it in the freezer until I can use them for something. 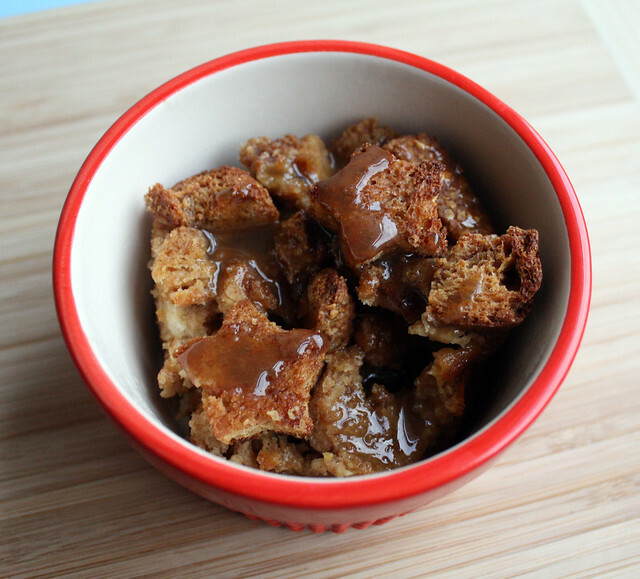 When it gets too full, I start looking around for recipes that use bread as a primary ingredient and yesterday I decided to make Bread Pudding with Salted Caramel Sauce from Cooking Light. I made a few changes to the original recipe. Most obviously, the recipe calls for cubes of french bread but I subbed in my freezer bread scraps (of course). We use whole wheat bread for sandwiches so it changed the character of the pudding a bit, but it was still nice. Also, the recipe calls for bourbon in both the pudding and in the sauce. 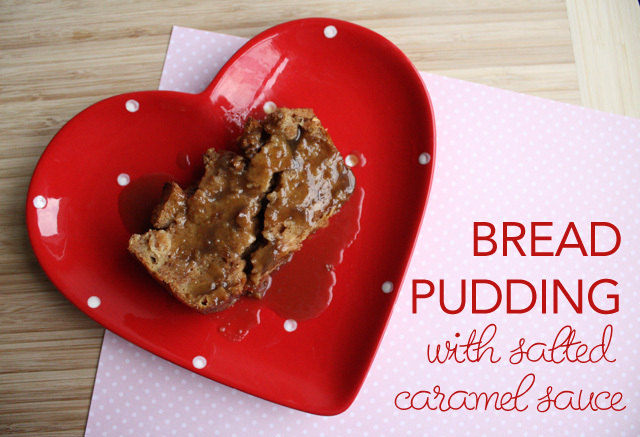 I was making this to eat with my boys so I left it out of the pudding altogether and swapped in plain water in the caramel sauce. I didn’t miss the hooch at all and since I’m not a bourbon fan, I think I would have liked this dish less had I left it in. Otherwise, I stuck with the recipe pretty closely. Spoon half of bread mixture into a 9 x 5 inch loaf pan coated with cooking spray. Drizzle 3 tablespoons sauce over bread mixture. Spoon remaining half of bread mixture over sauce. Bake at 350° for 45 minutes or until a knife inserted in the center comes out clean. Serve warm sauce with bread pudding. Holy moly! This was so freaking good! The bread pudding was fine by itself, but when you add the sauce it is to die for! It kind of reminded me of a sticky toffee pudding — moist and sweet and super sticky. The kids and I polished off the bowls I photographed in about 3 seconds and then they asked for more. I made them wait to have it for dessert after dinner and they were no less enthusiastic. 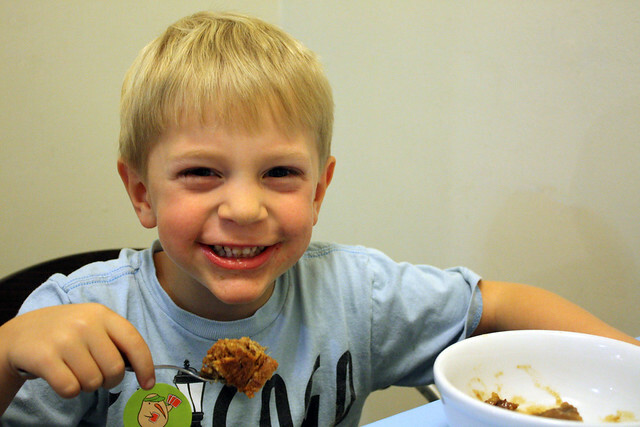 Augie liked it so much that he asked me to take a picture of him eating it! Ha! 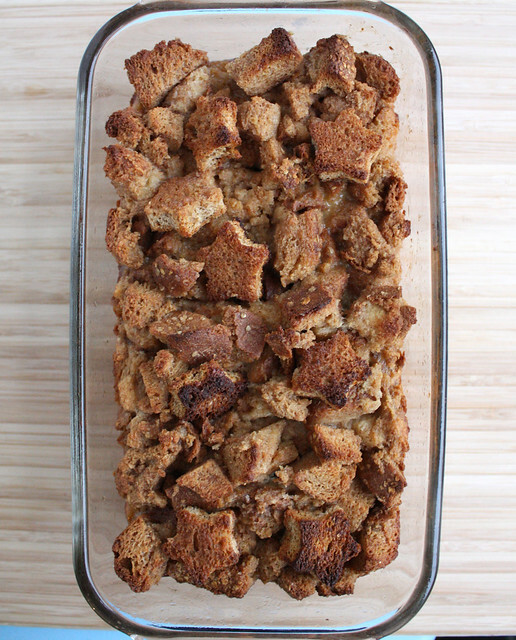 How do you use leftover bread?